Loaded carries develop unrelenting strength. The concept is simple, you pick up something heavy and go for walk. In addition, they’re also outstanding for conditioning, grip strength, and core strength. And, we all know that grip strength and core strength greatly contributes to full body strength. In other words, grip and core strength make us stronger, in general. 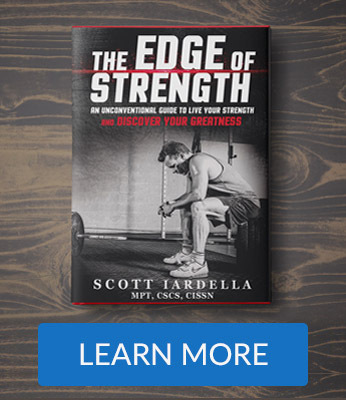 Carries also build mental toughness, strength endurance or work capacity, muscular hypertrophy, and a host of other unexplained benefits, some of which I’ll cover here. If there’s an exercise that could probably be used in any training session, it’s the loaded carry. The limiting factors, in most cases, are grip strength and core strength. You’ll probably discover your gaps if you haven’t done a lot of carries. 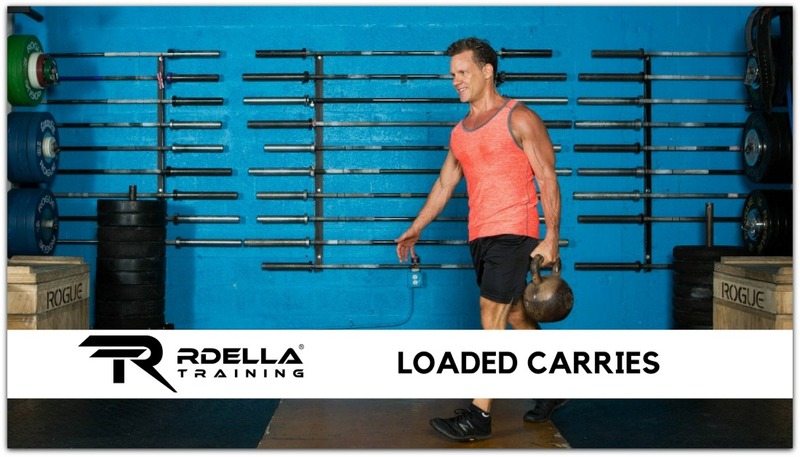 One of the most beautiful things about loaded carries is they are easy to learn, which makes them even more attractive to use in strength and conditioning programs of all levels. As a coach, I’ve experienced that they are one of the easiest things for people to incorporate into their program without spending a lot of time learning technique or progressions. I don’t have to coach proper form because the act of carrying a heavy object is mostly self-corrective. What I mean is that your body discovers what it must do to carry a heavy load. It self-corrects. Everything happens reflexively to hold the kettlebell or other implement. Things just happen. 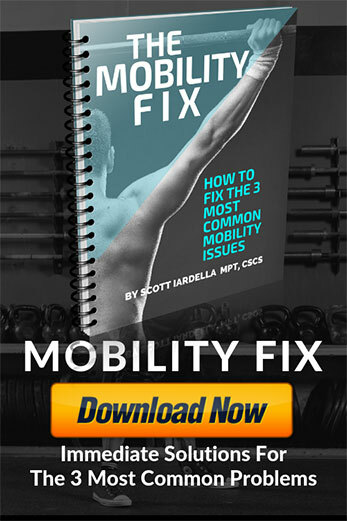 WHICH TRAINING TOOL IS BEST FOR CARRIES? It depends on the type of carry. I use kettlebells a lot. However, dumbbells, special barbells with handles designed for farmers walks, and other tools can be used. Besides kettlebells, I love these traveling farmers walk handles below to load a couple of plates for Farmers walks or suitcase carries. This is the million dollar question, how far should you walk when doing your carries? 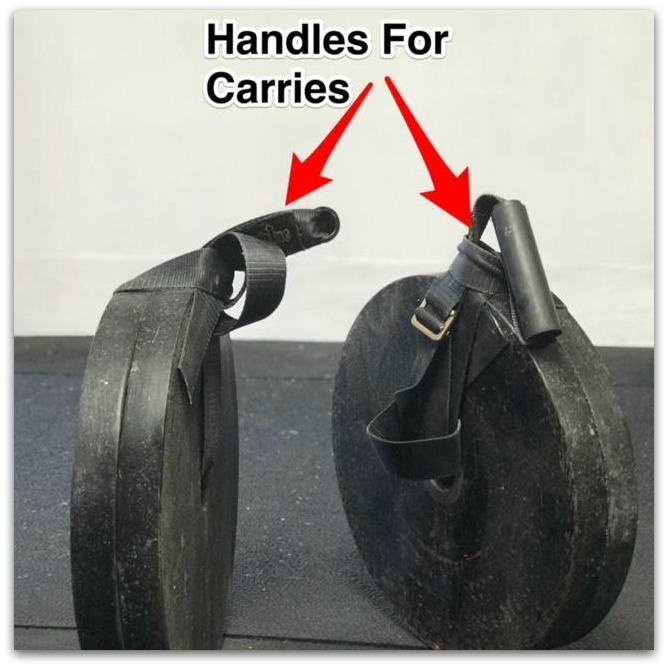 The easiest way to use loaded carries is to decide on what type of carry you’re going to do, pick up the training implement, and walk for distance. Just go. Then when you start to break down (you’ll know when), put the training implement down and take a rest, then walk back to where you started. If you’re up for it, repeat. How far to walk? Go for distance, rest, walk back. Then, repeat if you can do it another round or two. Or walk in a small area for as long as you can, as you can see in the video below. Don’t overcomplicate it, just walk. HOW MUCH WEIGHT SHOULD YOU CARRY? It depends on your training experience, general strength and conditioning levels, gender, and other factors. In general, I like Dan John’s standards in his book Intervention as a great reference point. These are suggested standards and they’re good to know what to shoot for. Men: Farmers carries for men, half bodyweight per hand for at least 20 meters and maybe up to 40 meters. Upper limit is carrying total bodyweight per hand. Women: Upper-limit is 85 pounds per hand. Let’s take a look at the 5 carry types and these can be thought of in order of progression. Suitcase carries are when you have a weight in one hand only, like you’re walking through the airport holding a heavy suitcase. What’s interesting about suitcase carries is they are very difficult when you have a heavy weight because you’re stabilizing asymmetrically. Specifically, asymmetric carries have been found to uniquely challenge the lateral musculature (oblique abdominal wall and quadratus lumborum) unlike anything else. This strengthens and stabilizes the “core” and allows for more hip power. And, hip power the key element in developing athleticism. This is a unique feature of the suitcase carry – or asymmetric carry, the opposing side muscle contractions to stabilize and balance an imbalanced load. Farmers carries are the carry you can really load up with and go heavy. The standards referenced previously from Dan John are based on farmers carries. With farmers carries, you have a training implement in each hand, you pick them up and go for walk for as long as you can. If the weight is correct (meaning it’s heavy enough and not light), your grip and conditioning will likely be the limiting factors. It’s incredibly physically taxing to carry to two heavy training implements in each for distance. I usually prefer to have the same weight in each hand, however, I have done them with imbalanced loads (asymmetric farmers carries, as pictured below). I like the unique and unbalanced challenge. Farmers carries (with balanced loads on each side) are probably the carry I do most often, but there are several great options that are outlined here. These are brutal folks. 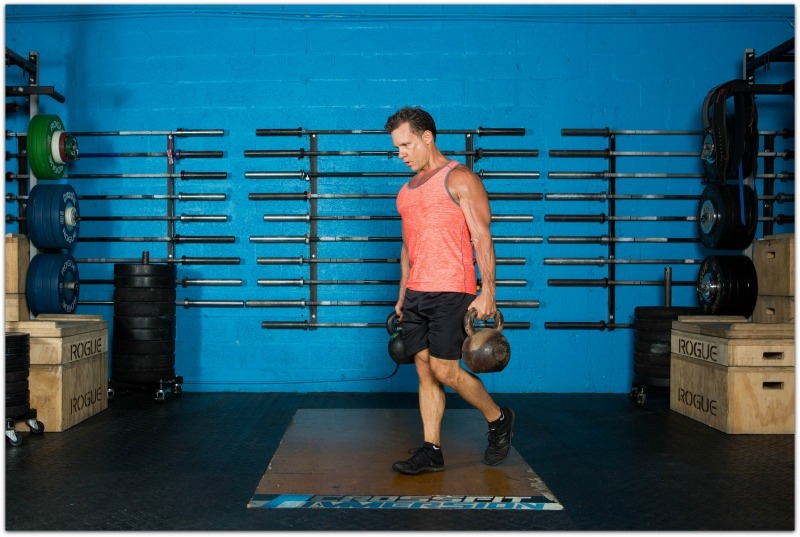 I prefer to use kettlebells with racked carries and you have the option of using one bell or two (two is harder, of course). You pick up the bell and carry it in the “racked” position, which is in front of your body with your hand(s) positioned approximately in front of your clavicle. The ab contraction is intense as racked carries force your abs and trunk musculature to fire at a very high level to keep stability. Mental toughness is required here. I should probably do these more often, to be honest. This is simply carrying the weight in the overhead position with the arm fully extended. The overhead carry can be done with one arm or two. If you’ve not done a lot of carries in this way or you have shoulder concerns, use only one bell. This carry is excellent for shoulder stability because the shoulder girdle musculature and rotator cuff is firing throughout the exercise to hold the bell in place. 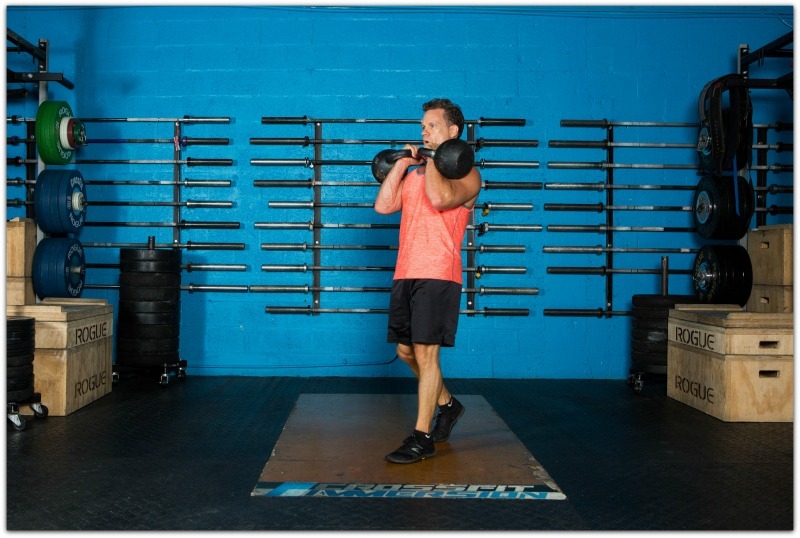 Renowned spine rehab expert, Dr. Stuart McGill, has described the bottoms up kettlebell carry as the way to forge athleticism. 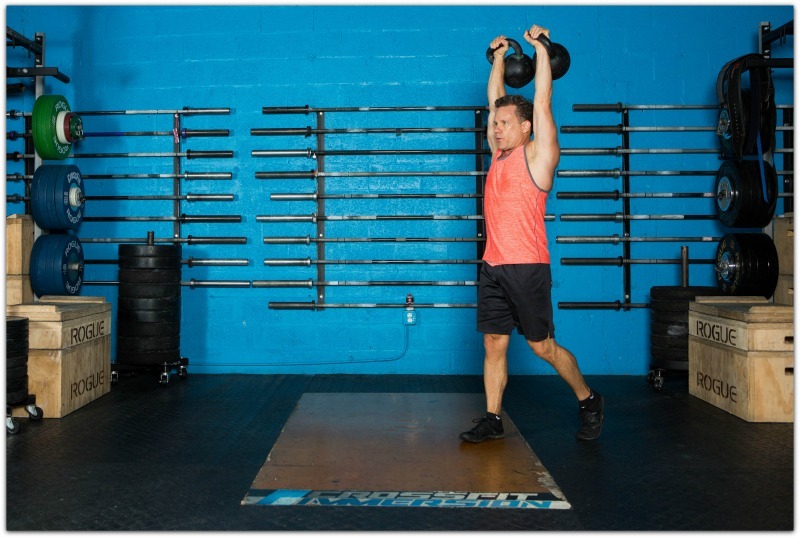 As with any asymmetrical kettlebell carry, it’s excellent for activating the deep abdominal wall muscles and the quadratus lumborum (an important muscle involved in hip and trunk motion and stability). In the bottoms up kettlebell carry, the kettlebell simply inverted to the upside down position. You keep the elbow tucked close to the body and this position forces you to grip the bell very hard. The core stiffening that’s going on with this is extremely high because you have to tighten everything to prevent the kettlebell from losing position. It’s wild how the inverted kettlebell position intensifies things. 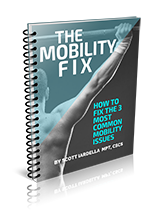 In McGill’s research, the core activation was even higher in the bottoms up carry in nearly all muscles. Again, it’s intense. If you’ve never tried a bottoms up carry, start with lighter kettlebell to experience what it feels like. This is one you definitely want to get a feel for in the beginning. Dr. McGill has stated that every program designed to enhance athleticism requires a carry task. HOW OFTEN SHOULD YOU DO CARRIES? Yes, you could do some type of carry with every training session if you wanted and it would probably be fine. If you look at the fundamental movements that should be included in a training session (push, pull, squat, hinge, carry), the carry is in there. Personally, I prefer to do carries about twice per week (sometimes more). I always do them at the end of the training session after I’ve done all my explosive work and heavy lifts. I think you could do them with almost any training session you do as long as they don’t interfere with anything else (i.e. your big lifts). As a general rule, do them after you’re done with your most important exercises and lifts. This only makes sense, unless you’d like to use them as part of a warm-up phase. They can be used in variety of programs and can usually enhance the effectiveness of a program. Carries are unique, they are simple, and they are very effective for general strength and conditioning. Every great program deserves a carry, wouldn’t you agree?